Dental implants allow our Trinity Beach family dentist Tony to transform the lives of people with missing teeth. Unlike removable prosthetics or restorations that require altering healthy tooth structure, implants are stand-alone replacement teeth that have the potential to last for decades. 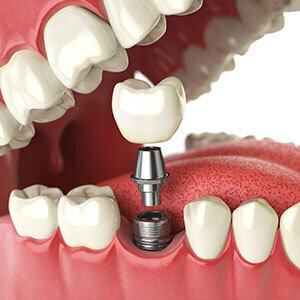 Each implant serves as an artificial ‘tooth root’ that is anchored into your jaw. The surgical process is usually a straightforward one, with most people saying that it’s more comfortable than having a tooth extracted. We are fortunate in Cairns to have the services of two excellent surgical implant specialists, Dr Brian Finn (Oral Surgeon) and Dr Brian James (Periodontist). Tony works closely with both in the planning phase of treatment to ensure the best possible result will be achieved. After new bone has grown around and integrated with your implant, it becomes permanently fused into place. It is at this point where Tony can set a variety of fixed restorations over the implant to replace your missing teeth. Single Porcelain Crown: When we place an individual crown over an implant, it recreates the function of a natural tooth. Plus, it’s just as easy to care for; just brush and floss it regularly to keep the gums around it healthy. Fixed Bridge: For several missing teeth in a row, an implant bridge is a long-term alternative to wearing a removable partial denture. Using as little as two implants, we can place a three- or four-tooth bridge into the open area. Implant Retained Denture: Implants offer a convenient solution for individuals who struggle with a secure denture fit. Depending on the design, implant dentures can be permanently affixed into place or made to snap in and out for easy home care. Are dental implants right for you? Contact Trinity Beach Dental today to schedule a complimentary consultation. Be sure to ask about our interest-free payment options!